Thank you for your interest in supporting local farmers and enjoying local foods while on vacation in Holden Beach. We collaborate with NC State University’s Fork to Farmer project and with local partners to power the online sale of produce bags from local farmers. Please click below and select how many produce bags you want for your vacation week or weeks. To pick up your Vacation Vittles bag(s), go to the Beach Mart in Holden Beach. Bags will be in the glass door coolers labeled with the name the order was placed under. Bags can be picked up the Saturday of arrival after 2-10pm or Sunday 8am-12pm. If not claimed by Sunday at 12pm the bag will be donated to a local food pantry. Vacation Vittles sells beach vacationers at Holden Beach one or more produce bags filled with local food grown and harvested by farmers located in Brunswick, Columbus, and Bladen Counties, North Carolina. Youth ambassadors at Men and Women United for Youth and Families, CDC will fill the Vacation Vittles Produce Bags and deliver them on Saturday of each week. To pick up your Vacation Vittles bag(s), go to the Beach Mart in Holden Beach. Each Vacation Vittles Produce Bag will be filled with a variety of produce picked at the peak of freshness by area farmers and packed and delivered the following day for easy customer pickup the day they arrive in Holden Beach. Each bag will contain enough fresh produce to feed a family of four at least three servings of fruit and vegetables for the week. In June, the Vacation Vittles Produce Bag will contain enough fresh produce to feed a family of four at least three servings of fruit and vegetables for the week. Listed below are the types of fruit and vegetables typically included in a June produce bag; however, the actual contents of your bag will vary depending on each week’s harvest. Each customer vacationing in Holden Beach during the month of June may order one or more bags of produce. 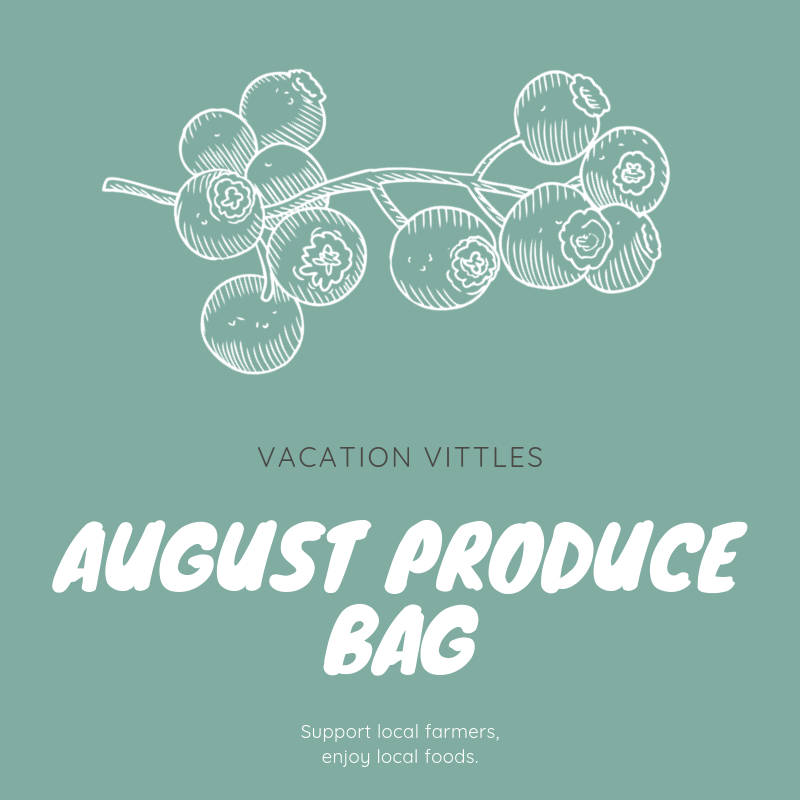 In July, the Vacation Vittles Produce Bag will contain enough fresh produce to feed a family of four at least three servings of fruit and vegetables for the week. Listed below are the types of fruit and vegetables typically included in a July produce bag; however, the actual contents of your bag will vary depending on each week’s harvest. Each customer vacationing in Holden Beach during the month of July may order one or more bags of produce. In August, Vacation Vittles Produce Bags will contain enough fresh produce to feed a family of four at least three servings of fruit and vegetables for the week. Listed below are the types of fruit and vegetables typically included in August produce bags; however, the actual contents of your bag will vary depending on each week’s harvest. Each customer vacationing in Holden Beach during the month of August may order one or more bags of produce. Keep up with what's happening at People-First Tourism. Join our mailing list to receive updates on new Journeys and Day Trips. Copyright © 2011-2017 NC State University. All rights reserved. Licensed exclusively to People-First Tourism, Inc.
People-First Tourism® and P1T® are registered trademarks of People-First Tourism, Inc.